Hospital stays can have significant negative effects for people with dementia. This article explores methods of improving dementia care in general hospital wards. 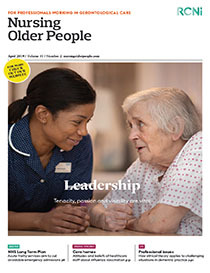 Taking its starting point as the importance of person-centred care, it explores ways of improving the ward environment, meaningful activities, personal history work, involving carers, and identifying and treating delirium. Practical strategies are suggested in each of these areas. The article acknowledges that implementing change can be challenging in NHS settings where wards are understaffed, and time is precious. However, it encourages all nurses working in these settings to recognise the importance of person-centred care for people with dementia and to make even small changes that can have a significant effect.